Eti is a marketing professional with 20 years of experience in PR and marketing. She is passionate about blogging, lives on the web and strives to make it measurable and easy to use for businesses. In modern marketing vernacular we no longer talk about articles, columns, or even stories. Nowadays it’s all about content, an umbrella term that includes not only articles but infographics, surveys, images, ebook, and more. All of these things are content pieces that have the potential to attract new audiences – but what is the best? The answer lies with blogging. By running both a company blog and working with bloggers on campaigns, brands get the best of both worlds and a variety of content that can be transformed and utilized on different platforms. Everyone and his uncle has a blog these days, but don’t let that discourage you from starting your own company blog. Industry blogs have been a massive boon for companies like Hubspot, for example, by continuously drawing in convertible traffic, even through old posts! Becoming an expert in your field worthy of listening to, isn’t just for clicks; if you’re a startup with little marketing budget, for example, running a quality blog is a cheap and effective way to get your name out there. Plus, your SEO will never die if a popular blog post keeps bringing in new readers. However, like most good things, building an audience does require patience, and consistently putting out good content is difficult. To counter the inevitable writer’s block, think cross-platform: one great ebook published on your blog can turn into several posts optimized for different platforms, shareable infographics, videos, surveys, and more. Why does this type of content ‘work’? Truthfully, sometimes it doesn’t. If you spend five minutes on a post you are unlikely to get many views. Likewise if you are completely clueless as to what your audience actually wants to read. Create some audience personas and look up keywords associated with what questions they have about the field. See if anyone else has answered them and do it better. 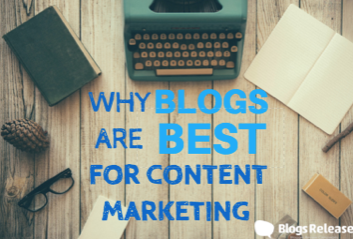 Business bloggers typically take at least four hours to write a post, and the popularity of longer posts (1,500 words on average) attests to the public’s desire for content that is more in-depth, informative, and addresses their personal needs. It’s no wonder that industry professionals are beginning to consider blogs to be the most valuable type of content and are expanding their influencer marketing budget – the massive success of influential bloggers speaks for itself. Brands like Coca Cola, L’Oreal, Ford, and more are already capitalizing on this vibrant community. Working with influencers to create content or giving bloggers products to review has many perks, the first of which is a fresh take on your product and brand personality. Partnering with influential bloggers to create even one piece of content in the form of a blog post can once again be repurposed into your own infographics, case studies, and social media engagement. Accessing your and the blogger’s audience at once is mutually beneficial, and can result in big spikes to your traffic if you figure out how to make the buzz last. For more content marketing tips and strategies, sign up for Content Marketing World – our annual marketing conference and expo, taking place September 6-9, 2016 in Cleveland, Ohio!BLOG100 saves $100 – so be sure to register today! And do so by 5/31 to take advantage of both the early bird rates as well as the extra $100 off.